Andrzej Wajda. Official Website of Polish movie director - Theatre - "Hamlet IV"
The drama begins: Teresa Budzisz-Krzyżanowska, deep in thought, enters the dressing room with a tired walk, dressed in her private (read: women's) clothes. She walks behind a screen and starts changing into Hamlet's costume. She doesn't behave like an actor preparing for a routine job - her whole attitude indicates someone getting ready for a difficult, painful, unrewarding task, perhaps a final struggle. 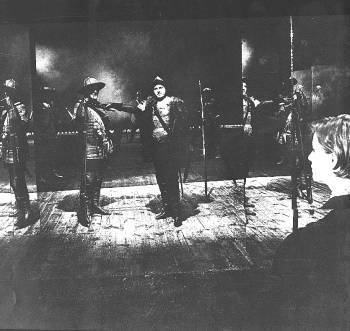 As she is nears the end of her preparations, the lights on the big stage come on and actors' voices are heard: the Hamlet performance has started with the opening scene, before the prince of Denmark enters the action. But when that moment finally arrives, he/she does so with such inner reluctance, that the "action" must in a way follow him and move, at least partly, back to the dressing room.